Okay, not only have you gone gluten-free, but apparently, you can’t have eggs, either. That doesn’t mean your Thanksgiving is completely ruined! 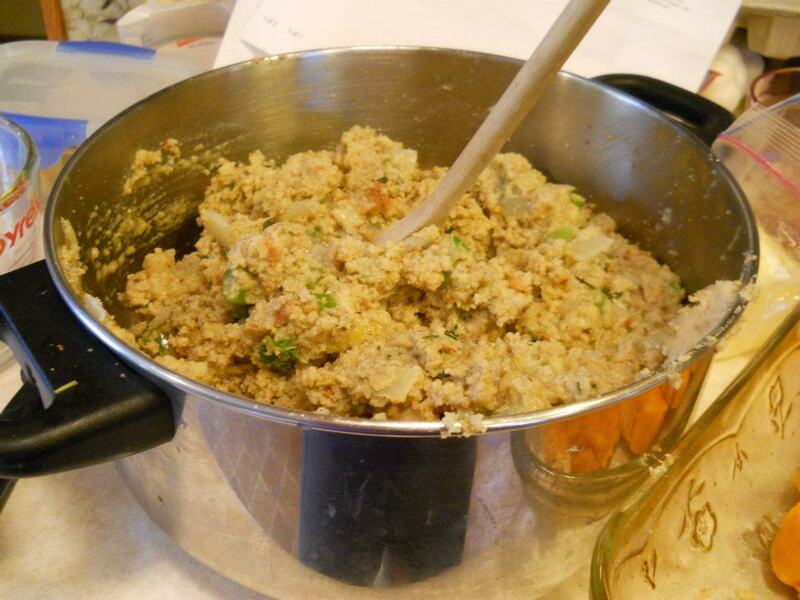 I’ve used this gluten-free corn bread dressing for years (even during a short period of time when my family went completely vegan) and it’s just as yummy every time. And if you can’t have corn, don’t worry. I’ve substituted our gluten-free brown rice loaves and brown rice buns, which are completely corn-free and it’s been just as delish! I prefer to use fresh sage out of my garden, however, if you like the flavour of sage, dried is definitely going to give you a stronger taste. In a large skillet over medium heat, melt Earth Balance. Saute the celery and onion until soft. In a large bowl, combine the celery, onions, 3 cups crumbled corn or brown rice bread, eggs (or substitute), stock and sage. Add salt and pepper to taste; mix well. Bake at 350 degrees F (175 degrees C) for 30 minutes. I like to bake it until it’s a little brown on the edges.